Over 25,000 square feet of space includes a variety of cardio and weight training equipment, plus areas for stretching and core training, it's all available to you. The two cardio training areas, one in the main Fitness Centre overlooking the park and one on the Cardio Deck overlooking Gym 3 are sure to inspire you to keep going! New to the Fitness Centre? Our qualified and friendly Fitness Centre Team can assist you with a quick spot for a bench press or a lesson on how to use a piece of equipment. 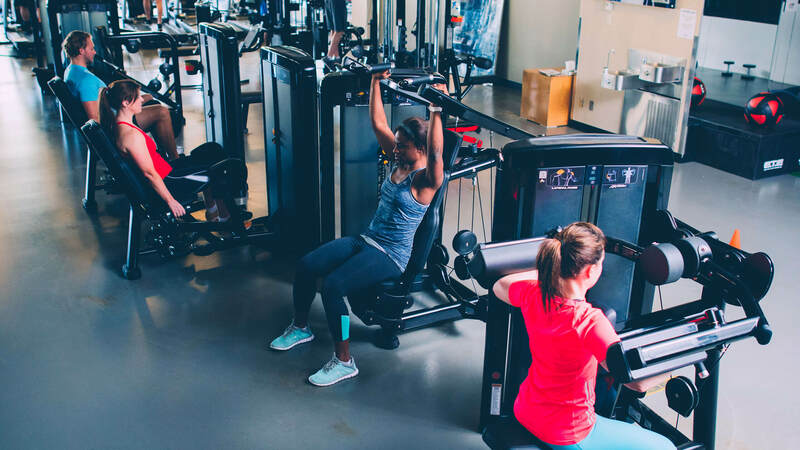 For those that would like a little extra knowledge we offer a complimentary Fitness Centre orientation where our team will show you where equipment is located, how it works and ensure you are feeling comfortable using it. When you need help just stop by the Fitness Centre Desk and grab a team member. Please note Monday to Friday from 5:00pm to 8:00pm is our busiest time so we are unable to offer full orientations during that time. Strength training offers many bonuses to young athletes and teens who want to enhance their fitness level. It can even help to put them on a lifelong path to better health and fitness. The orientation will allow teens 13-15 years old to gain access to the Fitness Centre without being accompanied by a parent. Our team of experts will provide a safe atmosphere where teens can learn appropriate strength training techniques and how to execute movements properly. To get started, please fill out the Teen Orientation Questionnaire. We have a huge range of equipment available to borrow including basketballs, badminton racquets, soccer balls, resistance bands, skipping ropes, lifting straps and belts, lighter weights and medicine balls (1 – 3lbs). No children under 13 years of age are allowed in the Fitness Centre. Children aged 13-15 must be accompanied by an adult. One adult may not supervise more than 2 children. Only our employees and coaches are permitted to train within our facility. Keep cell phone use to a minimum. Proper attire (including a shirt, bottoms and closed toe shoes) is required. Please wipe equipment after use. Adhere to time limits on equipment during peak times. Beverages are permitted provided they are in a sealed container only. No glass containers, please. No food permitted in the following spaces: Track, Pools, Gyms, Studios and Fitness Centre. All cardio equipment is set to a 30 minute maximum time limit so each of our members has equal opportunity to benefit from our machines. If you complete your time limit and no one is waiting for your machine, feel free to hop back on! Proper attire (including a shirt, bottoms and closed toe shoes) is required. Please wipe equipment after use with cleaning supplies provided. Allow others to work in and share the machines. Remove and re-rack weights from all machines.